Thank you for joining us for our Go for Greece Training Group Blog Hop for April! 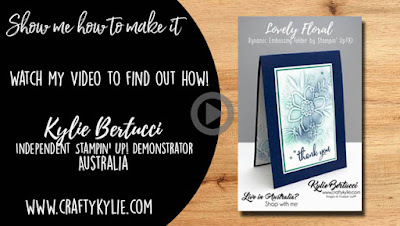 We are all part of the Go for Greece Training group so that we can improve our Stampin' Up!® businesses and learn from top Stampin' Up!® Demonstrators from around the world. 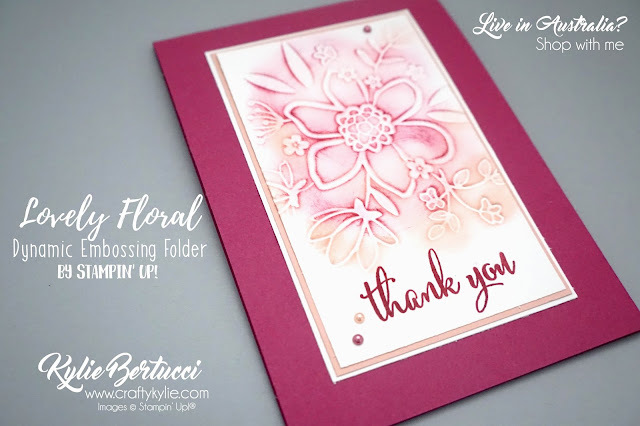 I used the BRAND NEW Lovely Floral Dynamic Embossing Folder that will be available to order on the 1st June. Make sure you add this one to your shopping list. The item number is 148048. I used Night of Navy and Emerald Envy in this card - the Emerald Envy is sadly retiring so make sure you stock up stat. When the new catalogue comes you can swap this out for Call me Clover instead. 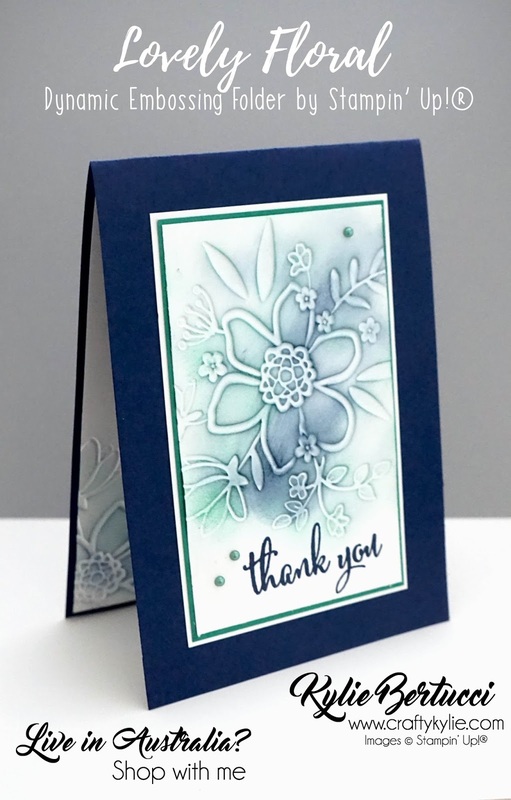 Watch my Youtube video to see how simple it is to make this stunning card with this fantastic embossing folder. Have you subscribed to my Youtube channel yet?? Make sure you do! Here is the one that I made on my video with the Berry Burst and Powder Pink colours. Amazing how swapping out the colours can create such a different look. Thanks so much for stopping by! Now here is our list of those hopping today. Please don't miss out on one post as all these wonderful people have worked so hard on our first hop together. 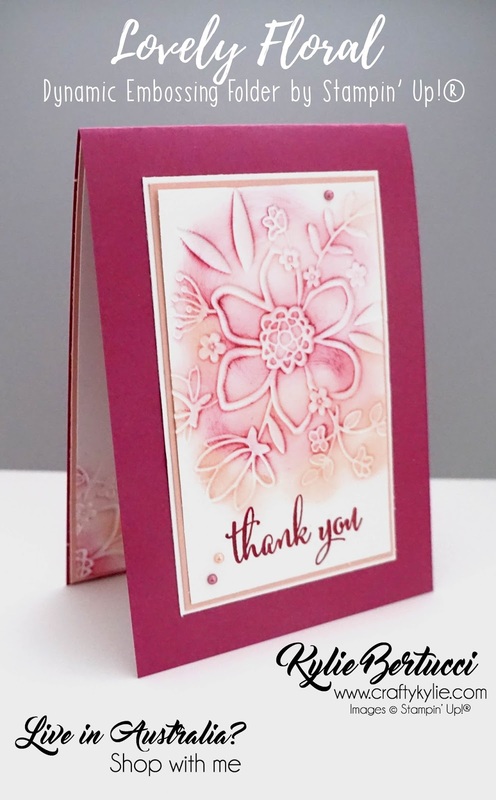 This is gorgeous, I love the colour combinations and the gorgeous sponging! O this embossingfolder I need to have. SUper cards! So pretty Kylie! Love it. Love it! I think I'm going to CASE it. So adorable! I have to do one asap! Thank you for inspiring me!